In Adam Lashinsky’s Fortune Data Sheet, Senior Writer Erin Griffith last month wrote, “I recently found myself carelessly repeating a statistic that I’d heard dozens of times in private conversations and on public stages: “Nine out of 10 startups fail.” The problem? It’s not true. Cambridge Associates, a global investment firm based in Boston, tracked the performance of venture investments in 27,259 startups between 1990 and 2010. Its research reveals that the real percentage of venture-backed startups that fail—as defined by companies that provide a 1X return or less to investors—has not risen above 60% since 2001. Even amid the dotcom bust of 2000, the failure rate topped out at 79%. Quibbling statistics aside, the fact remains: For the founder, failure is a very real option, and more often than not the likely outcome. Why? Usually, it’s not due to a bad idea; founders are able to devise ingenious solutions for the business problems they see. More often, failure is attributable to poor execution. Most startups fail because they are unable to create a usable product quickly that can be tested with their first customers. Or, when they do bring a product to market, they’re not able to iterate their product fast enough to find product-market fitness. Often, execution comes down to a question of the “committed” versus the “involved.” Founders are unquestionably committed; they’ll stake their livelihoods, their reputations, and their homes on their ability to solve the business problem they’ve identified. Motivation is not a question here. And yet, so many founders will entrust everything they’ve put on the table to a friend or relative who is, at best, involved. This often appears to be a promising shortcut at the outset, but too frequently the dynamic changes as the friend or relative gets busy with his or her other concerns, leaving the founder in dire straits with no minimum viable product (MVP) and dwindling time and money. We’ve seen this scenario play out at any number of promising-then-faltering start-ups. It’s a situation to be avoided from the get-go, for sure, but it’s also one that can be overcome even after it has been allowed to take root. In either case, the key for the founder is engaging a partner that can provide the skilled personnel, disciplined methodology, and entrepreneurial experience to build a usable MVP quickly that can be tested in the marketplace. Whether we’re working with a founder from the beginning to build a testable prototype and useable MVP, or coming in when the original plan for delivery is on the skids, the Agile MVP Development Framework helps mitigate risk while delivering a working product that can be put in the hands of early customers. With our Framework, founders don’t have to worry about hiring the right engineers or creating the right development process. We provide a fully functioning agile development team with access to architects, designers, developers and testers, all experienced in the pursuit of innovation delivery. 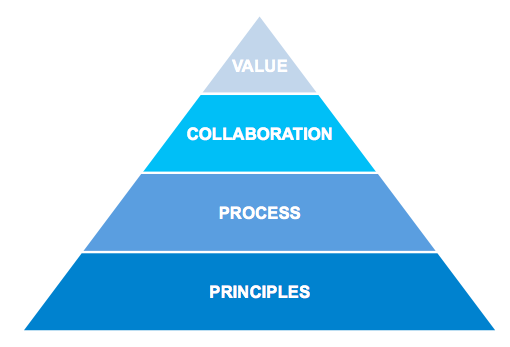 The Agile MVP Development Framework relies on a core set of principles, a defined process that’s simple and easy to understand and follow, and effective collaboration designed to build trust. Customer satisfaction is best achieved through rapid delivery of useful software. Working software should be the primary measure of progress and should be delivered frequently. Changing requirements should be welcomed, even if late in the development process. There should be close interaction between developers and business teams with full transparency. Customers should ONLY pay for usable and working software. Quality issues are our responsibility and must be fixed on OUR time and OUR money. We follow a tightly orchestrated sequence to keep everyone focused on delivering an MVP quickly and ensuring that all development work achieves agreed-upon objectives. Our process is divided into Design, Develop, and Deliver segments, each scripted for maximum efficiency and minimal risk. Design Prior to moving into development, we spend two to three weeks creating a product backlog and running a quick design sprint. This step provides a common understanding of what the final product will look like and allows the team to coalesce around company culture. Develop Once we start building, we commit to delivering an MVP within three development iterations. Each iteration, or sprint, lasts approximatley one month. Each sprint consists of three weeks of development followed by a fourth week of testing, bug-fixing, and fine-tuning. Anything that takes more than three development iterations is assigned to the backlog for future releases. Deliver In each Deliver segment, the current iteration is presented to the client for formal acceptance. The expectation for each iteration is the delivery of working software. Acceptance criteria is established before each sprint starts, and client acceptance is required before moving on to the next sprint. Failure is the essential enemy of any start-up, and collaboration is the process by which we fight the essential enemy together. Success, on the other hand, is built on mutual trust. Founders need to be able to trust that our word is our bond. We earn trust by keeping promises and remaining constant and consistent in our communication. To foster open and easy communication, we employ a set of collaboration and project management tools on each project, through which clients have full visibility into each phase of the Design-Develop-Deliver process. Throughout the entire product development process, the MVP Development Framework is designed around delivering value to the client. Preserving institutional memory is paramount in scaling a start-up successfully. Relying on friends or relatives to help out in the early stages undermines that preservation effort. We see ourselves as the custodians of your intellectual property and institutional knowledge. Our mindset is to build a lasting relationship with our clients, and our strategy is to lay the foundation for scaling the company from the very start. Beyond filling the immediate needs for talented architects, designers, developers and testers, team augmentation through Creative Chaos gives clients access to a broader ecosystem of business and technical experts with first-hand experience launching and scaling companies through innovation delivery. With Creative Chaos at your side, you have a partner who has been there before, seen it before, and solved it before. The Creative Chaos Agile MVP Development Framework helps minimize execution risk and prepares start-ups for success. By bringing you into the Creative Chaos incubation and acceleration process, we turn the odds in your favor, helping you maximize the chances of creating a product-market fit solution, a viable business plan, and a scalable business.